USB Type-C charging is an awesome addition to many of the new Android devices launching this year. Faster charging speeds, reversible plug, a more sturdy connection – what's not to like? Well, USB Type-C is cool and all, but the reality is that most of the gadgets you and I own still use a MicroUSB plug, and that isn't going to change for quite some time. One of the biggest perks of MicroUSB charging is that they are pretty affordable if you buy them from the right place. 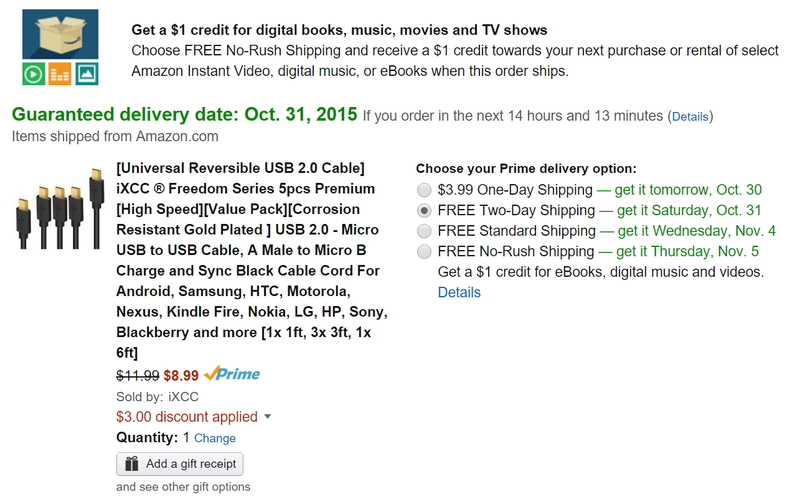 Today, using a coupon code, you can grab a five pack of super spiffy iXCC MicroUSB cables for $9 on Amazon. You might think, "Meh. They are just cables." These, however, are no ordinary cables! They are corrosion resistant, high gauge, heavy-duty, gold-plated MicroUSB cables with a reversible USB 2.0 end (that's the fatter side). That's right folks, you can't plug the USB 2.0 end in the wrong way! Have you ever seen such an incredible thing in your whole life? These cables are so awesome iXCC backs them with an 18 month warranty, which is probably rarely invoked since they score a solid 4.4 star rating on Amazon. How can you say no to a deal like this?!? IT'S FREAKING AMAZING! Whoa. Sorry guys, a little bit of my inner infomercial salesman escaped there. I feel terrible that you had to see that. Anyways, the discounted pack includes your standard assortment of cables, including 1x one-foot cable, 3x three-foot cables, and 1x six-foot cable. Apply the coupon code 8O75T7S8 at checkout to drop the price to $9. Keep in mind that the code only works on this particular length assortment.